It’s nice to be surrounded by friends, amigas, companions, besties...whatever you want to call ‘em. People we can laugh alongside, share a dairy-free coconut dark chocolate sundae with, and dish our feelings out to…. Forming relationships like that takes time and effort but it’s totally worth it and hella fulfilling. Do you want the same solid relationships in your biz? Creating solid communication strategies, such as growing your email list, will help you form deeper relationships with your potential clients and customers. You want to attract the right people, just like your besties IRL, who are interested in what you have to say. And you want to give them something in return. A few weeks ago, I wanted to buy a pair of leggings for my daughter so I signed up for an email list to get a discount. I got about 12 emails in 3 days. Because I wanted to receive the emails and they reminded me to get on it, and buy the leggings Madeline really wanted. When you WANT to be in the know, you do not unsubscribe. Think of the emails you get. Which ones do you like to read? Do you like getting emails from certain brands over others? Take note! I know you’re probably sick of me saying it, but you have to talk directly to your ideal client avatar and make sure the content you’re sending them is continuing to build and nurture your relationship with them. You also need to know what your peeps are struggling with and how your product or service helps them solve those problems. Research is key in creating a great lead magnet. And for those who are just joining the convo, a lead magnet is something you give to a potential client in exchange for their email. Lead magnets come in all shapes and sizes — cheat sheets, checklists, ebooks, videos, etc. Remember we talked about that give and take? Are you ready to build your own list? Let’s do it - from easy to hard - from level 1 to level 3 - from appetizer to dessert. Sorry, I just got snacky. But seriously, the easiest way to get a few email addresses is to put an opt-in on your website. Have a place where people can sign up for your weekly newsletter or monthly blog. Wait a second….are you already vacationing in email town?! See... it doesn’t need to be that hard. You can also add a link to your opt-in on your Facebook page or Instagram profile with an offer for your ebook or cheat sheet! These types of lead magnets are easy to create and people LOVE them. Create a free curry...I mean online tool or resource that will help your customers out! Do you have a cell phone? Well then you can make a video. Seriously, invite a girlfriend over and get them to record you. Make a series of 5 one-minute videos on your area of expertise and offer it on your website and social channels. My girl Chanti Zak, who is a copywriter and funnel strategist, joined me on the Whole You Podcast this week to talk about building your list with quizzes and creating copy that resonates. She is the quiz queen and shared a ton of valuable insights. Click hear to listen to the podcast! Quizzes are super fun and have the ability to generate a ton of new leads. They can also help you segment your list and generate relevant data about your audience. Not only that but quizzes have higher conversion rates than most lead magnets and will have you checking off “build my email list” off your to-do list in no time. 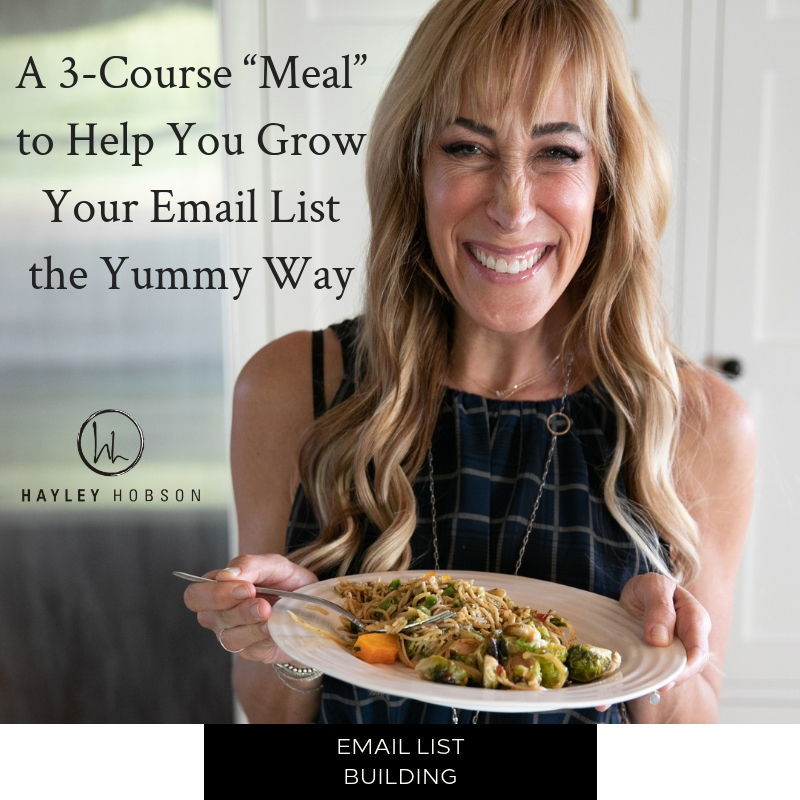 Are you drooling over the thought of setting up your email list yet? Or are you still eating our delicious entree and want me to slow my roll? If so, that’s okay, just skip dessert and keep on reading. But if you’re ready to up your email game even more, think about creating a webinar, or creating a free email course. These methods are a little more advanced but can change your biz life in a big way. No matter what level you’re at, these are tried and true methods for getting those emails and growing those relationships. But none of them will do any good if no one knows about them. How are you going to drive traffic to your offer? If you have a simple opt-in on your home page, put a call to action for it in an Instagram post! Are you releasing a new ebook? Do a Facebook Live about it! There are lots of free ways to grab people’s attention and start a conversation. And if you’re further ahead in the game, you can pay to drive traffic through Facebook and Instagram ads. When it comes to email list building, just remember the ultimate goal is to get someone to buy what you’re selling! And the more direct you can be in communicating with your ideal client — AKA email — the higher the chance they’re going to pick up what you’re throwing down. What is the biggest challenge you’re facing in building your own email list? Let me know in the comments so I can help you out!